So that's all that we have from Auckland. We are now set to go to Hamilton with the series alive and all to play for. Only a day's gap between the games and New Zealand will have to pick themselves and come back just like India did today. Join us for the coverage of the third and final T20 of this tour that will begin at 2000 local (0700 GMT) on the 10th of February. Till then, take care and cheers! India skipper, Rohit Sharma, says he's really pleased to see how they bowled to start with and then were clinical with the bat. Feels that there's quality in the side but they executed their plans well in this game, so is happy about that. Adds that it's important to understand the mistakes they made, learn from them and play with a clear mind. Reckons that the final game in Hamilton will be a tough one, but is relishing the challenge and winning the series there. New Zealand skipper, Kane Williamson, says it will always be difficult to replicate the performance from Wellington. Mentions that they should have been smarter with the bat and got to about 180-190. Reckons that the start for India took the game away from them. Continues saying that they are fully aware of the good things they've done, but are also cautious of the bad ones and they will work on them. Applauds the crowd in Eden Park as they always provide a fantastic atmosphere. Ends by saying that the decider will be a good one and hopes his team can deliver. Man of the Match, Krunal Pandya, says he feels nice to contribute to the team's win. States that the dimensions of the ground are different to Wellington, so you have to adapt which he did. Adds that there's everything to play for in Hamilton so is looking forward to it. FINALLY! India have a win in T20Is in New Zealand. It was always going to be difficult for the Kiwis to defend this score of 158 on the small ground. 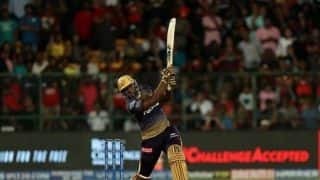 And it proved to be exactly the same way here as the Indians have reached the target in a canter with 7 balls to spare. 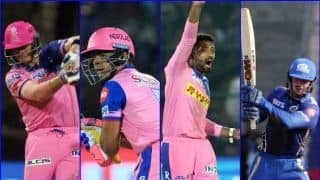 The chase started in a brilliant fashion for the Men in Blue when stand-in skipper Rohit Sharma smashed the bowlers to all parts in the Powerplay as his partner Shikhar Dhawan gave him good company. 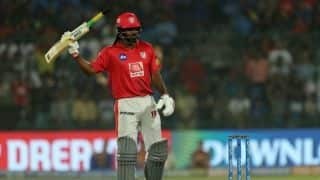 The Hitman reached his fifty and immediately fell but by that time, he had ensured that his team was in a very comfortable position. 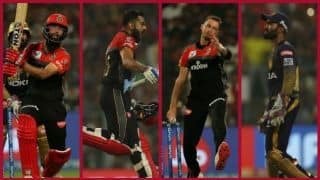 Dhawan and Shankar too fell in an attempt to finish things off quickly but that did not hamper the visitors as Dhoni joined forces with Pant and finished things off for the Indians. 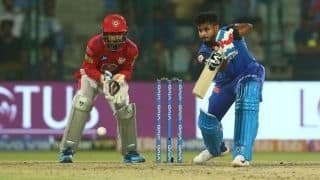 End of over 19 ( 10 Runs )IND 162/3 Rishabh Pant* 40(28)Ms Dhoni 20(17) 18.5Scott Kuggeleijn to Rishabh Pant. FOUR, FOUR! All over. Kuggeleijn delivers it very full and outside off, it's hammered down the ground by Pant and that wraps things up for India. VICTORY BY 7 WICKETS and the Men in Blue keep the series alive at 1-1 as we go to Hamilton. 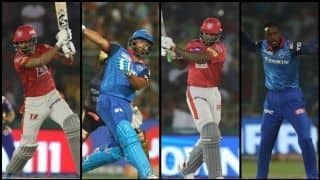 18.4Scott Kuggeleijn to Rishabh Pant. no run, Another dot ball! Bouncer on middle, Rishabh is beaten by the bounce and pace. 18.2Scott Kuggeleijn to Ms Dhoni. 1 run, No, he doesn't. A shorter ball on middle, Dhoni looks to pull it away and does so but the ball goes off his arm and behind the stumps for a single. 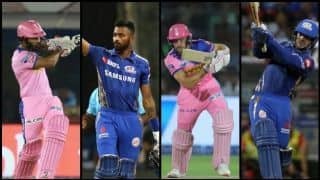 18.1Scott Kuggeleijn to Rishabh Pant. 1 run, Slower ball on the middle and leg stump line, Pant swivels and turns it away fine on the leg side for a single. End of over 18 ( 8 Runs )IND 156/3 Ms Dhoni* 19(16)Rishabh Pant 35(24) 17.6Lockie Ferguson to Ms Dhoni. 2 runs, Comes from 'round the wicket and angles across a length ball outside off. Dhoni stays back and threads it through covers for another two. Only 3 needed. 17.5Lockie Ferguson to Ms Dhoni. no run, Fullish and angling in on off, Dhoni is on the front foot as he pushes it back to the bowler. 17.4Lockie Ferguson to Ms Dhoni. 2 runs, Bang! Short and wide outside off, Dhoni whacks it square of the wicket on the off side and collects another brace in this over. 17.3Lockie Ferguson to Rishabh Pant. 1 run, Slower delivery, on a length around middle, Pant walks across and paddles it down towards short fine leg for a run. 17.2Lockie Ferguson to Ms Dhoni. 1 run, A yorker outside off, Dhoni squeezes it out to point for one. 150 runs for IND 150 runs for IND 17.1Lockie Ferguson to Ms Dhoni. 2 runs, Fullish and whipped behind square leg for a couple of runs. End of over 17 ( 13 Runs )IND 148/3 Ms Dhoni* 12(11)Rishabh Pant 34(23) 16.6Tim Southee to Ms Dhoni. 1 run, Oh God! The screws are coming off the New Zealand train here. A length ball outside off, Dhoni pushes it to point and sets off for a quick single but decides against the run in the end. The fielder has a shy at the non-striker's end where Pant had backed up a long way but misses. There is no cover for the throw and an overthrow is taken. Needless from the Black Caps. 16.5Tim Southee to Ms Dhoni. 2 runs, On the hips this time, pushed away to deep mid-wicket and in the gap for a couple of runs. 16.4Tim Southee to Rishabh Pant. 1 run, Very full outside off, driven down to long on for a single by Pant. 30 runs for Rishabh Pant 30 runs for Rishabh Pant 16.3Tim Southee to Rishabh Pant. SIX, SIX! You come into his arc, you go out of the park! A fuller length ball on middle and Pant just swings through the line, finishes with one hand off the handle. The ball still has enough to go over the deep mid-wicket fence. 30 runs for Rishabh Pant 30 runs for Rishabh Pant 16.3Tim Southee to Rishabh Pant. wide, 1 run, Wide! Short of a length! The ball goes well over the batsman's head. Signalled wide by the umpire. 16.2Tim Southee to Ms Dhoni. 1 run, Short and with pace this time, pulled away hard to deep square leg by the Indian keeper for a single. 16.1Tim Southee to Rishabh Pant. leg byes, 1 run, Slower ball on top of middle by Southee. Pant looks to heave it away but the ball hits him on the sides and goes on to the off side. A leg bye is stolen. End of over 16 ( 6 Runs )IND 135/3 Rishabh Pant* 27(20)Ms Dhoni 8(8) 15.6Ish Sodhi to Rishabh Pant. 1 run, Shorter one to end the over, pulled away to deep square leg for a single. Sodhi ends with 4-0-31-1. 15.5Ish Sodhi to Ms Dhoni. 1 run, Clever! Very clever from MS! Dhoni was charging down the ground to hit that one but Sodhi throws the ball flatter and well outside off to get the batsman stumped. Dhoni though adjusts as he puts his left hand out and keeps the ball out towards point. Picks up a single as well. 15.4Ish Sodhi to Ms Dhoni. no run, Flatter one on middle, Dhoni adjusts with the slight turn and keeps it out towards cover. 15.3Ish Sodhi to Rishabh Pant. 1 run, Slower one pushed through well outside off, Pant hangs hit bat out and hits it over the head of Ish for a single down to long on. 15.2Ish Sodhi to Rishabh Pant. 2 runs, Always looked like dropping it, Taylor! Not sure eventually he got even his fingertips on it. A short ball around leg, Pant top edges his attempted pull shot and it flies towards fine leg. Taylor runs from short fine leg but fails to catch the swirling ball. They take two. 15.1Ish Sodhi to Ms Dhoni. 1 run, Skips down the track and forces it down to long on for a run. End of over 15 ( 7 Runs )IND 129/3 Ms Dhoni* 6(5)Rishabh Pant 23(17) 14.6Tim Southee to Ms Dhoni. 1 run, Shortish on off, Dhoni walks across and helps it through square leg for one. Every run from MS Dhoni's bat is cheered by this jam-packed stadium. 14.5Tim Southee to Ms Dhoni. no run, Walks down the track and punches it to the off side, finds the fielder at covers. 14.4Tim Southee to Rishabh Pant. 1 run, Quick single, a young lad and an old tiger stealing it right under mid off's nose. Southee aims for the blockhole but ends up serving a low full toss on off. Pant pushes it through the line and scampers across. 14.3Tim Southee to Ms Dhoni. 1 run, Yet another short ball by Tim, this time Dhoni is nicely on the back foot as he blazes his pull shot to deep square leg for a run. 14.2Tim Southee to Ms Dhoni. FOUR, FOUR! Dhoni starts with a boundary. Wrong line from Southee, short and around leg, MSD just turns inside the crease and pulls it fine down the leg side. The crowd certainly loved that. 14.1Tim Southee to Ms Dhoni. no run, Starts with a length ball angling back into the batsman, Dhoni flicks it across the line, barring much timing and finds the mid-wicket fielder. End of over 14 ( 15 Runs )IND 122/3 Rishabh Pant* 22(16)Ms Dhoni 0(0) 13.6Daryl Mitchell to Rishabh Pant. no run, Short of a length outside off, Pant looks to cut it away but it was too close to his body. He misses out. A wicket in the over but expensive in the context of the game. 13.5Daryl Mitchell to Rishabh Pant. FOUR, FOUR! The pressure after the wicket is let off on the very next ball. Shorter length ball on middle and leg, pulled away by Pant over fine leg for a boundary. 3 wickets down for IND. Out batsman is Vijay Shankar 3 wickets down for IND. Out batsman is Vijay Shankar 13.4Daryl Mitchell to Vijay Shankar. out, OUT! Caught at the longer part of the boundary. That is the second time in this innings that an Indian batsman has holed out to the pull at deep mid-wicket. A half-tracker from Mitchell and it was a poor ball, should have been dispatched over the fence. Shankar looks to pull it away but the ball goes off the bottom of the bat and Tim Southee takes his second catch pretty easily. Shankar departs in a bid to score two sixes on the trot, India now need 41 runs in 38 balls. 13.3Daryl Mitchell to Vijay Shankar. SIX, SIX! A low full toss smacked over long off for a six. Wow! Never mind the short boundary, that is a wonderful shot. Mitchell misses the yorker by some inches and Shankar lifts it on the full and deep over the long off boundary. 13.2Daryl Mitchell to Rishabh Pant. 1 run, A fuller length ball outside off, driven hard past the bowler for a single down to long off. 13.1Daryl Mitchell to Rishabh Pant. FOUR, FOUR! Welcome, Daryl! A length ball on middle and at his pace, it is just a half-volley. Pant flicks it over fine leg and for a boundary. End of over 13 ( 10 Runs )IND 107/2 Vijay Shankar* 8(6)Rishabh Pant 13(12) 12.6Scott Kuggeleijn to Vijay Shankar. FOUR, FOUR! Just out of the reach of Williamson who was running back and into the fence. A length ball outside off, Shankar sees mid off up and lifts the ball over his head. Kane tries to run back but the ball is just too far. Good effort though from the NZ skipper. 12.6Scott Kuggeleijn to Vijay Shankar. wide, 1 run, Wide! Too high this time and it goes over Vijay's head. Given wide by the umpire. 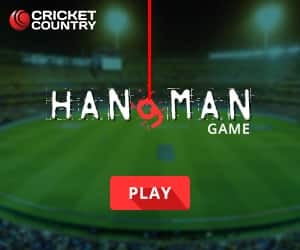 12.5Scott Kuggeleijn to Vijay Shankar. no run, Fuller this time outside off, driven hard back at the bowler who does well to make a stop on his followthrough. 12.4Scott Kuggeleijn to Vijay Shankar. 2 runs, Brilliant save from Ish in the deep. 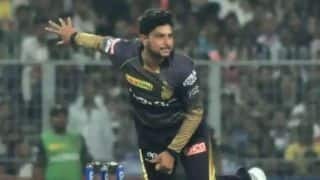 A short length ball on top of middle, Shankar pulls it away towards fine leg where Sodhi moves to his left and makes an incredible save putting out his left hand. A poor throw though ensures that a couple is taken. 100 runs for IND 100 runs for IND 12.3Scott Kuggeleijn to Rishabh Pant. 1 run, Pacy bouncer once more, Pant looks to pull but is late on the shot. Gets it high on the bat and the ball lands just to the next of the pitch on the leg side. A quick run is taken, that brings up the 100 for the visitors. 59 needed now in 45 balls. 12.2Scott Kuggeleijn to Vijay Shankar. 1 run, A fuller length ball on off and middle, driven hard down the ground to long on for a run. 12.1Scott Kuggeleijn to Rishabh Pant. 1 run, A short length ball on top of middle stump, Pant looks to pull but gets an inside edge onto the pads and a quick single is stolen. End of over 12 ( 9 Runs )IND 97/2 Rishabh Pant* 11(10)Vijay Shankar 1(2) 11.6Ish Sodhi to Rishabh Pant. 1 run, A shorter one on middle, jabbed away to the leg side for a run by RP. Good over for India in the context of the game, 9 off it. 11.5Ish Sodhi to Rishabh Pant. no run, Unnecessary! A slower ball on a shorter length outside off and going the other way. Pant looks to reverse sweep that ball but fails to put bat on ball. 11.4Ish Sodhi to Rishabh Pant. FOUR, FOUR! Smashed! A flighted ball well outside off, Pant does well to reach out and hit it wide of extra cover and well to the right of long off. No chance for the fielder, the timing was too good. 11.3Ish Sodhi to Vijay Shankar. 1 run, Flighted on middle, pushed away along the ground to long on for a run by Shankar. 11.2Ish Sodhi to Rishabh Pant. 1 run, Flatter one on middle, pulled away to deep mid-wicket for a single. 11.1Ish Sodhi to Rishabh Pant. 2 runs, Risky second! Tossed up ball on middle, Pant turns it gently off his pads through square leg and rushes back for the second run. The throw from the deep comes to the keeper who breaks the stumps as Rishabh dives in. Direct hit would have been interesting. End of over 11 ( 5 Runs )IND 88/2 Vijay Shankar* 0(1)Rishabh Pant 3(5) 10.6Lockie Ferguson to Vijay Shankar. no run, Pacy again! 146 clicks outside off and Shankar looks to put bat on ball but the pace causes him to get beaten. Top over by Lockie. 10.5Lockie Ferguson to Shikhar Dhawan. out, OUT! Bounced out! Last time it was a 151 kph yorker which cleaned the southpaw and this time, Ferguson puts this one halfway down the pitch at 145 clicks. The ball rears up and Dhawan is in a poor position as he looks to pull. The ball takes the gloves and goes high in the air but just to point where de Grandhomme settles under it and takes an easy catch. One has brought two. New Zealand need more of these though. 71 runs needed off 55 now. 10.4Lockie Ferguson to Rishabh Pant. 1 run, Good length ball around leg, angling down, Pant flicks it through square leg and rotates the strike. 10.3Lockie Ferguson to Shikhar Dhawan. byes, 1 run, Cuts down on his pace to beat the batsman and his keeper also. Digs it short and around off, Dhawan is early into his pull shot and misses. Seifert too fumbles behind and they steal a bye. 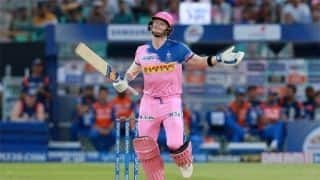 30 runs for Shikhar Dhawan 30 runs for Shikhar Dhawan 10.2Lockie Ferguson to Shikhar Dhawan. 2 runs, Fetches a short ball from outside off and slaps it back past the bowler to long on for a run. Hang on, Bracewell (sub) attacks the ball in the deep and misfields, allowing the second run. 10.1Lockie Ferguson to Rishabh Pant. 1 run, Starts this spell from 'round the wicket and serves a length ball outside off, Pant eases it down to third man and collects a run. End of over 10 ( 6 Runs )IND 83/1 Rishabh Pant* 1(3)Shikhar Dhawan 28(28) 9.6Ish Sodhi to Rishabh Pant. 1 run, Short of a length, a pull all along the ground by Pant to deep mid-wicket for a single. A successful over for NZ, 6 runs and a wicket off it in the end. 9.6Ish Sodhi to Rishabh Pant. wide, 1 run, Wide! Sprayed way outside off, Pant looks to cut but pulls out of the shot in the end. Signalled a wide by the umpire. 9.5Ish Sodhi to Rishabh Pant. no run, Outside off and this one does not bounce. Pant looks to pull it away but the ball keeps too low. 9.4Ish Sodhi to Shikhar Dhawan. 1 run, A fuller one outside off, driven down to long off for a single. 9.3Ish Sodhi to Rishabh Pant. byes, 1 run, Confusion! But in the end, all is okay. A good ball outside off going straight on, Pant leans into the drive but misses the ball. The keeper fails to collect it cleanly and Dhawan calls Pant for a bye. Rishabh was late to the run but manages to make it courtesy a bad throw. 9.2Ish Sodhi to Rohit Sharma. out, OUT! De Grandhomme for New Zealand and now Rohit for India. Both have fallen after reaching the 50-run mark. Gets out playing his favourite shot, the pull, once more. A half-tracker from Sodhi, was meant to be hit but the ball climbed too high on Rohit who looked to pull it away. The ball gets him high on the bat and goes straight into the waiting hands of Southee at deep mid-wicket. New Zealand finally have the breakthrough they so badly needed. India need 80 runs off 64 balls. 9.1Ish Sodhi to Shikhar Dhawan. 1 run, On the pads this time, worked away for a single to deep mid-wicket. 9.1Ish Sodhi to Shikhar Dhawan. wide, 1 run, Wide! Sprayed down the leg side, Dhawan looks to make contact but it is too far away. End of over 9 ( 11 Runs )IND 77/0 Shikhar Dhawan* 26(26)Rohit Sharma 50(30) 8.6Mitchell Santner to Shikhar Dhawan. 1 run, Flicked away to deep mid-wicket by the southpaw for a run as he retains strike. 50 runs for Rohit Sharma 50 runs for Rohit Sharma 8.5Mitchell Santner to Rohit Sharma. 1 run, Flatter one on the pads, worked away for a single to mid-wicket. That is FIFTY FOR ROHIT! His 16th in T20Is. The last three international innings for him were 1, 2 and 7. He breaks the run-scoring drought and comes back to form in style. 8.4Mitchell Santner to Rohit Sharma. SIX, SIX! Huge! Moves to 49 with that one. A flighted one on middle, Rohit comes down the track and lifts it straight back over the bowler. Goes into the sightscreen. 8.3Mitchell Santner to Shikhar Dhawan. 1 run, Very full on this occasion, turned away behind square on the leg side for a single. 8.2Mitchell Santner to Rohit Sharma. 1 run, Shorter one outside off, pushed away off the back foot wide of cover. Single taken. 8.1Mitchell Santner to Shikhar Dhawan. 1 run, Flatter one on the pads, flicked away to deep square leg for a run. Sensible batting from Dhawan this. End of over 8 ( 11 Runs )IND 66/0 Shikhar Dhawan* 23(23)Rohit Sharma 42(27) 7.6Ish Sodhi to Shikhar Dhawan. 1 run, Short of a length, cut away to deep point for a single. Keeps strike. 11 off Sodhi's first. 7.5Ish Sodhi to Shikhar Dhawan. no run, Hurled in quicker well outside off, driven hard to cover. 7.4Ish Sodhi to Rohit Sharma. 1 run, Flighted this time outside off, Rohit opens the face of the bat and runs it fine of short third man for a single. 7.3Ish Sodhi to Rohit Sharma. 2 runs, Short outside off, cut away wide of point for a couple by RS. 7.2Ish Sodhi to Rohit Sharma. SIX, SIX! Dragged down and punished! Rohit rocks back and pulls this one away over the deep backward square leg fence for a biggie. He also becomes the highest run-getter in T20Is with that shot, going past Martin Guptill. 7.1Ish Sodhi to Shikhar Dhawan. 1 run, Flatter one on the middle stump line, whipped away to deep mid-wicket by Dhawan and he gets off strike. End of over 7 ( 5 Runs )IND 55/0 Shikhar Dhawan* 21(20)Rohit Sharma 33(24) 6.6Mitchell Santner to Shikhar Dhawan. 1 run, Quicker one on the pads, another single to end a good 5-run over from Santner. 6.5Mitchell Santner to Rohit Sharma. 1 run, Worked away off the pads towards deep mid-wicket for a run by Rohit. 6.4Mitchell Santner to Rohit Sharma. no run, Loopy this time outside off, Rohit mistimes his attempted cut. The ball goes off the under part of the bat and to the off side. No run. 6.3Mitchell Santner to Shikhar Dhawan. 1 run, Flatter this time again at the pads of the lefty, worked away to deep mid-wicket for a single. 6.2Mitchell Santner to Rohit Sharma. 1 run, Flatter one on off stump, turned away towards deep mid-wicket for a single. 6.1Mitchell Santner to Shikhar Dhawan. 1 run, Fuller one on the pads, glanced towards the right of short fine leg for a single. End of over 6 ( 8 Runs )IND 50/0 Shikhar Dhawan* 18(17)Rohit Sharma 31(21) 50 runs for IND 50 runs for IND 5.6Lockie Ferguson to Shikhar Dhawan. 1 run, A length ball on the middle stump line, pushed back uppishly towards long on by Shikhar. Brings up the 50 for India at the end of the 6th over. Great going from the Blue brigade. 5.5Lockie Ferguson to Shikhar Dhawan. no run, Shorter length ball outside off, cut with good timing by Dhawan but straight to the point fielder. 5.4Lockie Ferguson to Rohit Sharma. 1 run, Slower ball! Rohit is almost done in there as he mistimes his attempted hit. The ball goes on a bounce to long on though. A single is taken. 5.4Lockie Ferguson to Rohit Sharma. wide, 1 run, Wide! A short of a length ball but errs in his line. Sprays this way down the leg side. Signalled a wide there. 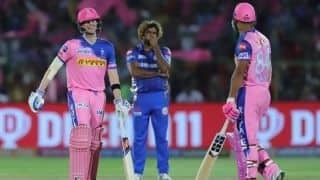 30 runs for Rohit Sharma 30 runs for Rohit Sharma 5.3Lockie Ferguson to Rohit Sharma. FOUR, FOUR! A fuller length ball outside off, pacy from Lockie but that does not bother Rohit. He calmly smashes it over the cover fielders and for a boundary. 5.2Lockie Ferguson to Shikhar Dhawan. 1 run, Slightly shorter this time outside off, tapped towards the right of point for a single. 5.1Lockie Ferguson to Shikhar Dhawan. no run, Length ball outside off, pushed off the back foot towards cover-point by Dhawan. End of over 5 ( 9 Runs )IND 42/0 Rohit Sharma* 26(19)Shikhar Dhawan 16(13) 4.6Tim Southee to Rohit Sharma. no run, Slower one, on a shortish length close to off stump, Rohit delays his horizontal bat shot but still finds point. 9 from the over, a good comeback by Tim after going for 8 in the first 3 balls. 4.5Tim Southee to Rohit Sharma. no run, Good length ball angling into the batsman, Sharma punches it from the crease to mid on. 4.4Tim Southee to Shikhar Dhawan. 1 run, Gets behind the line of the delivery and pushes it softly towards mid off for a quick single. 4.3Tim Southee to Shikhar Dhawan. FOUR, FOUR! Pulled with utter disdain! As soon as Southee digs in a short ball around off, Dhawan is on top of the bounce in his stance. He then displays his power there by sending it to the deep mid-wicket fence in no time. 4.2Tim Southee to Shikhar Dhawan. no run, Fullish and on off, Dhawan plays a good-looking off drive but it has gone straight to the mid off fielder. 4.1Tim Southee to Shikhar Dhawan. FOUR, FOUR! Up and over mid on! Southee overpitches around middle, Dhawan goes the aerial route and easily clears the infield. Good start to the over for India. Both their openers are looking quite settled. End of over 4 ( 12 Runs )IND 33/0 Shikhar Dhawan* 7(9)Rohit Sharma 26(17) 3.6Scott Kuggeleijn to Shikhar Dhawan. 1 run, Length ball on the pads, nudged towards square leg for a single and to keep the strike. 3.5Scott Kuggeleijn to Rohit Sharma. 1 run, Short this time again and it is pulled away by Sharma over mid-wicket. There is a fielder in the deep though and it is only one run. 3.4Scott Kuggeleijn to Rohit Sharma. SIX, SIX! That is just the class of this man. A fuller length ball on the pads and it is just helped on its way by Rohit. The ball flies over the ropes in a canter. With this, Rohit Sharma now has scored 100 sixes in T20I cricket. Join an elite list with only Chris Gayle and Martin Guptill being the other ones on it. 3.3Scott Kuggeleijn to Rohit Sharma. FOUR, FOUR! This time the short length ball is pulled over mid on. Not entirely well-timed but the ball has enough on it to clear the fielder in the circle and go to the boundary on a couple of bounces. 3.2Scott Kuggeleijn to Rohit Sharma. no run, Ouch! That one has got him in the box. A length ball and at good pace, Rohit looked to make room to free his arms and pulls it, but the bowler follows him and gets the batsman. He looks okay to continue though. 3.1Scott Kuggeleijn to Rohit Sharma. no run, Some improvisation from Rohit there as he looks to sweep this slower ball from Scott wide of short fine leg but hits the ball straight to the fielder. End of over 3 ( 11 Runs )IND 21/0 Shikhar Dhawan* 6(8)Rohit Sharma 15(12) 2.6Lockie Ferguson to Shikhar Dhawan. no run, Pushed away to point to end a good over for India. 11 runs off it. 2.5Lockie Ferguson to Shikhar Dhawan. 2 runs, In the air... but safe. Pace and bounce from Lockie, Dhawan looks like he got hurried on by that ball and mistimes his pull high in the air. But luckily for him, he had got enough to make sure the ball is well away from mid on. 2 runs taken. 2.4Lockie Ferguson to Shikhar Dhawan. no run, Short of a length outside off, Dhawan rides the bounce and defends it onto the ground. 2.3Lockie Ferguson to Rohit Sharma. 1 run, Short and wide outside off, Rohit cuts this one hard but there is a good diving effort from the fielder at point. Makes a half-stop and a single can be taken. 2.2Lockie Ferguson to Rohit Sharma. 2 runs, Pacy! 152 clicks fuller length ball outside off, Sharma drives this well to the right of extra cover for a couple. 2.1Lockie Ferguson to Rohit Sharma. SIX, SIX! Welcome Lockie! Short of a length and Rohit is a compulsive puller. Dispatches this one over deep mid-wicket for a maximum. End of over 2 ( 4 Runs )IND 10/0 Shikhar Dhawan* 4(5)Rohit Sharma 6(9) 1.6Scott Kuggeleijn to Shikhar Dhawan. no run, Missed out there Dhawan. A length ball straying on the pads, Shikhar looks to glance it fine but misses the shot. The ball goes off his sides and to fine leg but no leg bye can be taken. 1.5Scott Kuggeleijn to Rohit Sharma. 1 run, Full length ball on the pads, flicked away to deep square leg for a single by Rohit. 1.4Scott Kuggeleijn to Rohit Sharma. no run, Too high! A length ball on middle, Rohit comes inside the line and looks to swing it away over deep backward square leg but misses his shot. Gets hit on the thigh pad. Not much of an appeal though. 1.3Scott Kuggeleijn to Shikhar Dhawan. 1 run, Short of a length outside off, patted on to the off side with soft hands for a single by SD. 1.2Scott Kuggeleijn to Shikhar Dhawan. 2 runs, Length ball outside off, Dhawan drives this one slightly uppishly towards mid off where the fielder makes a half-stop only. The ball runs away and the batsmen can pick up two till it is retrieved. Kuggeleijn also had fallen down in his followthrough. 1.1Scott Kuggeleijn to Shikhar Dhawan. no run, Good start from Scott, an inswinging ball landing on off and Dhawan almost was done in by that. Looked to drive coming ahead but the inside part of the willow saves him in the end. End of over 1 ( 6 Runs )IND 6/0 Shikhar Dhawan* 1(1)Rohit Sharma 5(7) 0.6Tim Southee to Shikhar Dhawan. 1 run, Straighter in line this time and on the hips, Shikhar is off the mark as he nudges this towards square leg for a run. 0.5Tim Southee to Rohit Sharma. 1 run, Fuller length ball outside off, driven hard onto the pitch and towards long off for a single to bring Dhawan on strike for the first time. 0.4Tim Southee to Rohit Sharma. no run, Good ball. On a length and shaping away on top of off stump, Sharma defends from the crease. 0.3Tim Southee to Rohit Sharma. no run, Shoulders arms to this one outside off once more. 0.2Tim Southee to Rohit Sharma. FOUR, FOUR! Short and wide outside off, this time Rohit slashes at it and gets the ball wide of point. Third man cannot come around to stop it in time. India are up and away. Lockie in the deep is seen feeling his ankle a bit after that failed chase. 0.1Tim Southee to Rohit Sharma. no run, Length ball outside off, left alone by Rohit as the ball swings away.